There are multiple document converters available online that can help you convert PX3 to JPG and rotate the pages. To meet the requirements of different users, some document converters provide a command line application and a GUI application at the same time. VeryPDF PCL Converter is such a professional document converter which can help you quickly solve your problem. To try VeryPDF PCL Converter free, please click here to download it. After you install it, you can get scores of times to try it free. The following introduces the method to use the GUI application provided by VeryPDF PCL Converter to convert PX3 to JPG and rotate the pages, Four steps are required. The first step is to open the interface of VeryPDF PCL Converter as below. You can double click the icon of VeryPDF PCL Converter on the desk top. The second step is to add PX3 files. Please click the first button Add File(s) under the list box. Then select the PX3 files in the dialog box that pops out and then click Open to input the files. You can view the file names, paths and other information of the added files in the list box. If you want to remove some added files from the list box, you can keep pressing Ctrl and select them first, then right click on one of them, and click Delete Selected Items on the open-up list. If you want to delete all the added files, you can click Delete All Items. The third step is to set options. 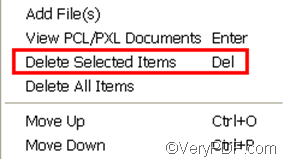 In order to generate JPG files from PX3 files, please click Setting under the list box. As a dialog box pops out, you should specify .jpg as the output format in the Output format combo box. To rotate the pages, you should select 90,270,or 180 from the drop down list that stretches out from the Rotate angle combo box. After setting options, please click OK in this dialog box and proceed to the next step. The last step is to click Start under the list box on the main interface. The Browse for Folder dialog box pops out and you can select a folder as the export folder. After you click OK in the Browse for Folder dialog box, the computer starts the task without delay. At the bottom of the main interface, there is a progress bar, through which you can check the conversion and rotating status. Normally, the result JPG files will be opened after the conversion by default. How to convert PX3 to JPG and set color depth? How to convert PX3 to JPG and set page orientation? How to convert PX3 to JPG and fit to paper size? How to convert PRN to bitmap and rotate the page? How to convert PRN to TIFF and rotate the page? How to convert PRN to PXL and rotate the page? How to Convert PX3 to PS? This entry was posted in VeryPDF Blog and tagged px3 to jpg, rotate the page. Bookmark the permalink.